Comment on "The Art of Life"
Invite "The Art of Life"
Support "The Art of Life"
The exhibit presents each work of art to the public to be appreciated for its own sake, but it also makes comment on the subject of each work, making a connection to the hotly-debated topic of abortion. 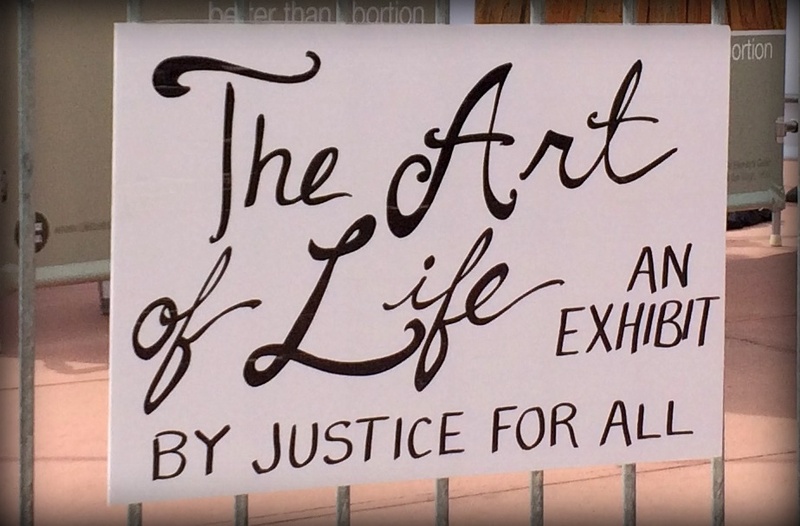 With The Art of Life, we at Justice For All continue in our passion of creating a different kind of conversation about abortion, one that engages both the heart and the mind. Our perspective is unambiguously stated at the bottom of each panel, that “the art of life is…better than abortion.” What’s your perspective? This page provides documentation for each of the panels, including links to source material, more information, and commentary. 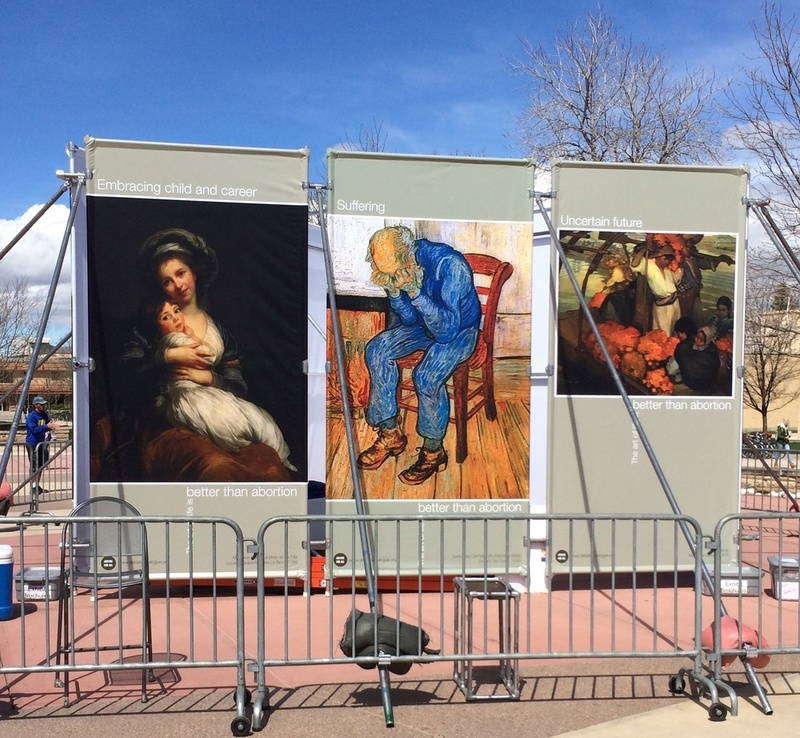 The panels of The Art of Life were designed to be placed in a triangle with three panels per side, but the order and sequence of the panels may vary from campus to campus. Note, this panel features a self-portrait (with daughter) of one of the chief portrait painters of Marie Antoinette. So, the painting itself is a real-life example of embracing both child and career. "Mona Lisa's Bad Hair Day"
CK Wisner interacts with a UCLA student in front of the "Humble Circumstances" panel in May 2016. See the "Photographic Timeline of Prenatal Development" at Abort73.com (specifically, note the photograph of an embryo at 6 weeks, taken by Lennart Nilsson). Paintings and photographs marked with an asterisk (*) are in the public domain in their countries of origin and other countries and areas where the copyright term is the author's life plus 100 years or less. Paintings and photographs marked with two asterisks (**) are in the public domain in its country of origin and other countries and areas where the copyright term is the author's life plus 95 years or less. Paintings and photographs marked with three asterisks (***) are used courtesy of the fabulous Getty Open Content Program. Justice For All's position is that faithful reproductions of two-dimensional works of art that are in the public domain cannot be copyrighted. View the Entire CSU April 2016 Event Gallery.